Saying that Mexico is violating the terms of a 1944 water treaty, federal lawmakers from Texas filed legislation Monday that they hope will compel the United States' southern neighbor to meet its obligations. A growing list of federal U.S. lawmakers is urging Mexico to comply with the terms of a 1944 water treaty they say its southern neighbor is violating. On Monday, Republican U.S. Sens. 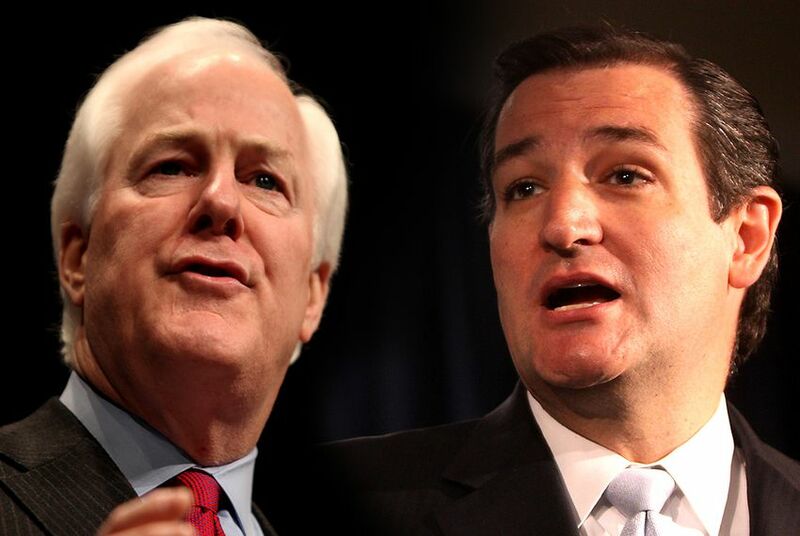 John Cornyn and Ted Cruz joined U.S. House members Filemon Vela, D-Brownsville, and Mike Conaway, R-Midland, in filing companion legislation called the Working to Address Treaty Enforcement Rapidly for Texas, or WATER Act. The 1944 treaty, also called the “Treaty of the Utilization of Waters of the Colorado and Tijuana Rivers and of the Rio Grande,” dictates how Mexico provides the U.S. surface water from six Mexican tributaries that feed into the Rio Grande. In exchange, the U.S. delivers water from the Colorado River to Mexico. Mexico is supposed to deliver to the U.S. 1.75 million acre-feet of water every five years, which U.S. lawmakers say means 350,000 acre-feet annually, unless “extreme drought” conditions in Mexico make the delivery impossible. The WATER Act would require the secretary of state’s office to submit reports detailing what efforts Mexico has undertaken to meet its treaty obligations. It would also mandate that the secretary’s office annually report the benefits the U.S. is receiving following an amendment to the treaty, officially known as Minute 319, that followed a 2010 earthquake in Mexico. Damage to the country's canal system that year forced Mexico to temporarily use Nevada’s Lake Mead for storage. Before the earthquake, the two countries were in the midst of negotiating how to share water during droughts. As a result of the agreement, Mexico would give up some of its water when the level in Lake Mead dropped to 1,075 feet, The Associated Press reported. The country would also “reap some of the surplus when it rises to 1,145 feet.” It would also be able to store about 260,000 acre-feet in the lake annually. The International Boundary and Water Commission, a binational agency responsible for enforcing water and boundary treaties, has taken the brunt of the criticism from state and federal lawmakers, who say the agency hasn’t done enough to ensure compliance. Sally Spener, a foreign affairs officer at the IBWC, has said that the office is working regularly to urge Mexico to make good on its deliveries. The legislation follows a letter Cruz and Cornyn sent to the State Department in March, urging the agency to take more decisive action. The list of lawmakers urging Mexico to comply also includes Texas Agriculture Commissioner Todd Staples, Gov. Rick Perry and state Rep. Eddie Lucio III, D-Brownsville. Just minutes after the legislation was announced, Staples lauded the congressional delegation’s efforts.